United States and China is the two largest economy of the world. Both country together shares 35.78% and 32.76% of total world's GDP in nominal and PPP terms, respectively. GDP of both country is higher than 3rd ranked country Japan (nominal) and India (PPP) by a huge margin. Therefore, only these two are in competition to become first. United States has been at first position since long time in both terms - nominal and ppp. But, According to IMF Outlook (October-2014), China is now ahead of US on PPP basis. On exchange rate basis, United States is still at top having GDP 1.68 times more than China. By 2019, this ratio will 1.43. On Purchasing power parity basis, economy of China was $619 billion less than US in 2013. 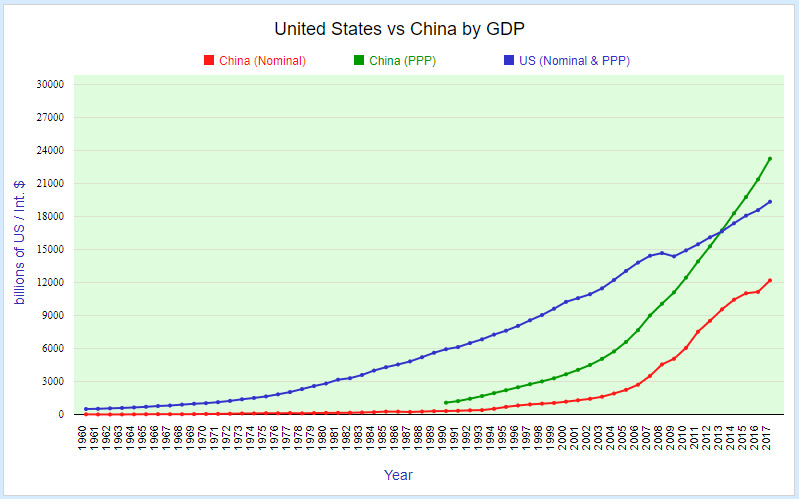 In 2014, GDP of China has expanded by $1483 compare to US figure $648. Now, China's GDP is $216 billion more than US. 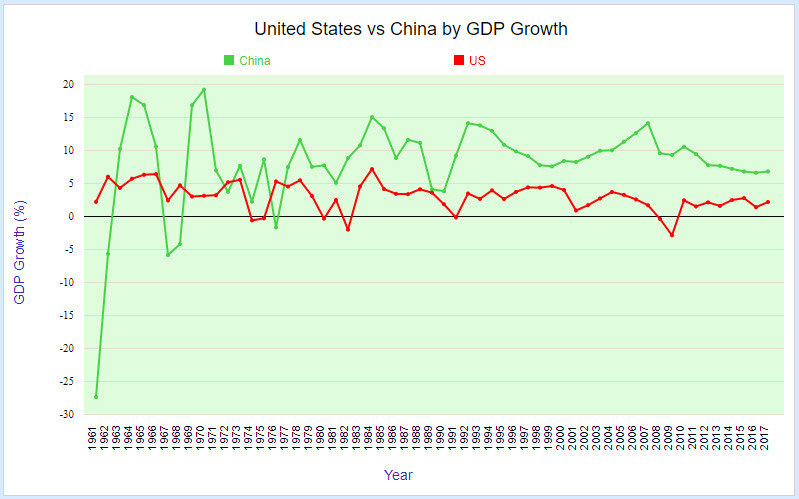 GDP Growth : During period 1980-2014, Average GDP growth of China was 9.8%. This number is very high compare to United States figure 2.65% in same period. China attains maximum growth of 15.20% in year 1984 and minimum 3.80% in 1990. Out of 35 years from 1980 to 2014, China grew by more than 10% in 16 years and more than 9% in 23 years. United States reached an all time high of 7.26% in 1984 and a record low of -2.78% in 2009. US shows negative growth 5 times. Per capita GDP : Due to vast populaion of China, difference between these two country is very high in terms of per capita income. Population of china is more than 4 times higher than US's population. In nominal terms, per capita gdp of China is $7,572, 80th position in world. While, United states is the 9th richest country of the world having gdp per capita around of $54,678. On PPP basis, gdp per capita of China is $12,893.